(Francisco Kjolseth | The Salt Lake Tribune) Utah Gov. Gary Herbert. As a gust of wind ruffled Gov. 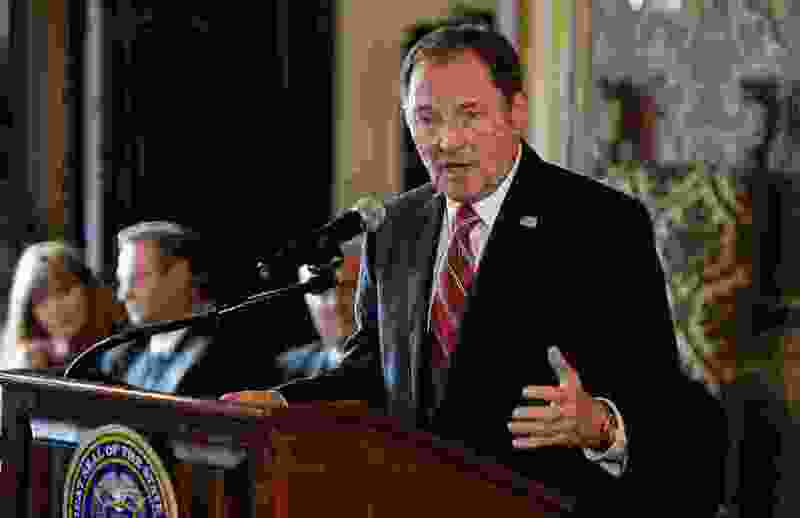 Gary Herbert’s hair, he said the weather Monday was symbolic of the Utah Transit Authority’s troubled past and its hoped-for better future after new restructuring. “It is kind of a blustery day, but it is bright out here,” he said. Then as two members of a newly revamped UTA board were then sworn in on the plaza of the downtown Salt Lake Central rail station, Herbert charged them to rebuild trust in the agency by improving transparency and more wisely spending its tax dollars. But a final third seat on that board remains vacant as Herbert is locked in a legal tug-of-war with the Utah County Commission about whether he must appoint one of two nominees it made as required by law — but whom the governor rejected. He asked that county to send other nominees, but it has refused and filed a lawsuit. The Legislature this year voted to disband UTA’s old 16-member, part-time board and replace it with a new full-time, three-member group. State leaders see the commission as better able to oversee an agency criticized for high executive pay and bonuses, extensive international travel, secretive meetings, and sweetheart deals with developers. “With new leadership, we have new opportunity to refocus, add a different perspective and improve our outcomes,” said Herbert — who has power under new legislation to fire UTA board members at will. UTA is $2 billion in debt as it essentially took out mortgages to build new rail lines in recent years. Paying interest on that debt takes a bigger slice of its budget than operating its bus lines. (Lennie Mahler | The Salt Lake Tribune) Carlton Christensen, new chairman of the restructured Utah Transit Authority Board. (Rick Egan | The Salt Lake Tribune) Beth Holbrook, new UTA Board trustee. Herbert said that as Utah’s population is expected to double over the next three decades, “how we handle that growth is what keeps me awake at night.” He said mass transit will be an increasingly important part of the solution to reduce traffic congestion and pollution. Greg Bell — the former lieutenant governor who chaired the old UTA board for the past year — said, “This is a momentous day.” He also led a moment of silence in honor of a maverick member of the old board who may be largely responsible for the new restructuring: Brent Taylor, the North Ogden mayor killed in action last week in Afghanistan. Meanwhile, the new board is facing continuing controversy because of the stalemate between the governor and the Utah County Commission over appointing the new board’s final third member. With only two new trustees in office, it will require unanimous votes to move forward on anything. Also, a lawsuit filed by Utah County last week with the Utah Supreme Court contends, among other things, that the new board actually has not been formed legally because it lacks all three members mandated by law and offers no representation to Utah County — raising legal questions about any of its actions. Under new state law, Utah County, after consultation with Tooele County, was able to nominate at least two people to a slot on the new board. The other two members were nominated by Salt Lake County and Davis County (after consultation with Weber and Box Elder counties). 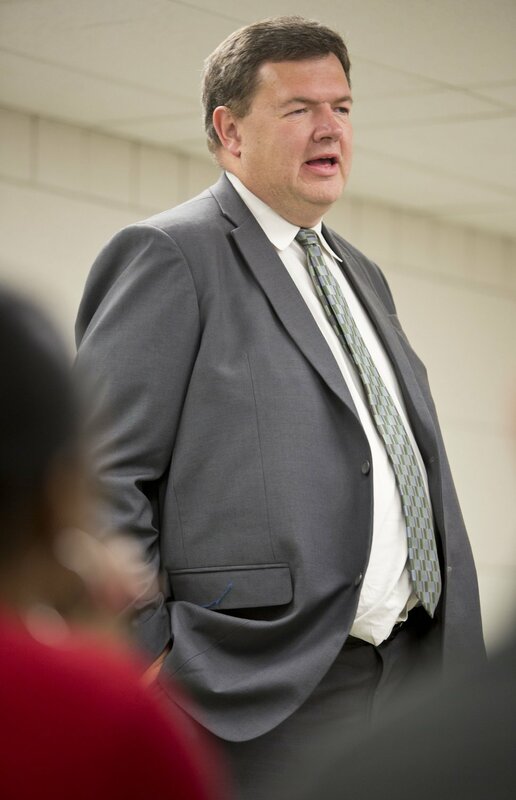 Herbert refused to appoint either of the two nominees sent by Utah County: Pleasant Grove City Council member Ben Stanley and former Cedar Hills Council member Rob Crawley. The pair have been publicly criticized as unqualified political allies of Utah County Commissioner Bill Lee. Herbert asked Utah County to send him additional names more to his liking — a request he earlier also made to Salt Lake County, which complied. Instead, Utah County filed suit contending state law mandates that he appoint one of its current nominees. On Monday at the swearing-in ceremony, Paul Edwards — Herbert’s spokesman — said nothing has changed in that situation. Stanley, one of Utah County’s nominees, attended the swearing-in ceremony Monday, and has regularly attended other public UTA and legislative transportation committee meetings. He said he wants to be able to jump in and serve should Herbert change his mind and appoint him. Stanley, who also is an attorney, has also been conducting what he calls a “consensus building tour” visiting officials in Utah and Tooele counties to help push his possible appointment.